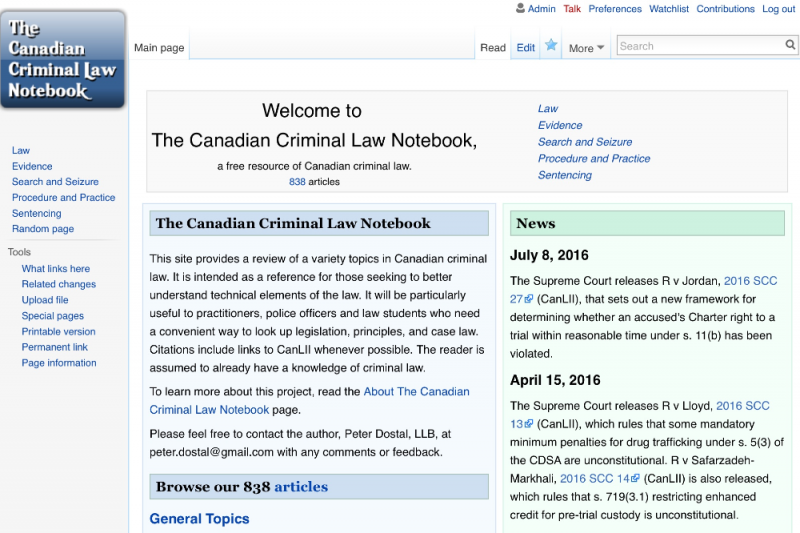 I've been running criminalnotebook.ca (including its predecessor website) for about 6 years now. It is an entirely solo writing project without any funding or support from anyone. I have been covering all costs myself but I would greatly appreciate help from the public. As of this writing, the website is seeing about 25-35,000 pageviews a month and it continues to grow. Part of the success has been on account of the webhosting performance, serving thousands of queries a day. This is entirely thanks to the quality webhosting service that hosts all my content. I hope to keep these materials free indefinitely. At least one way to ensure this is through contributions to cover the cost of webhosting. It's about $240 per year that I have been paying for myself. If you have used this website and feel you got at least a few dollars of value out of these materials, please consider making a donation to help me cover my costs. Any amount would be appreciated. An indispensable resource for anyone working in the criminal justice system. It is great resource that I use a lot. invaluable for both busy defense and busy crown... answers on the fly ! Invaluable resource for any Canadian Criminal Defense Bar. This is a really great resource, happy to donate!